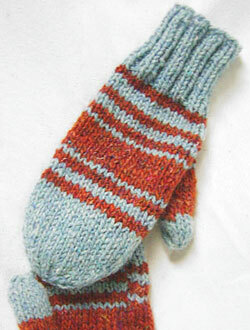 A great pair of classic mittens with a trendy stripe pattern, knit with worsted wool and a wool silk blend. Very warm and super cool. or size to get gauge of: 5 sts = 1"
- Using US 7 dp and MC, cast on 30 sts and divide evenly between 3 needles (10 sts each needle), mark beginning of round and call the first needle "needle 1"
-next round: k across needle 1, k across needle 2. then on needle 3, k to 2 sts from end, transfer these 2 sts to the beg of needle 1. then take sts from the beg of needle 2 and transfer to the end of needle 1 to equal 16 sts. then divide the sts on needles 2 & 3 evenly. 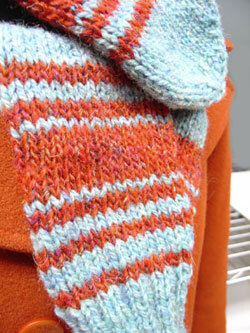 -pull yarn through remaining sts to close. -next round: k 2 sts on needle 1 and transfer to the end of needle 3. then take sts from the beginning of needle 2 and transfer them to the end of needle 1 to equal 16 sts. then divide the sts on needles 2 & 3 evenly.